Cancellations made within 48 hours will be charged atthe full rate for the first nights accommodation for each member of yourbooking using the card details provided at the time of the booking. Failure to check in on the booked date of arrival will incur chargeto your credit card of the full amount of the first nights accommodation forall non-arriving guests and the remainder of the booking will be cancelled. Check in from 4pm. Check out 10:30am. Check in through our hostel reception, Black Isle Hostel, 47-49 Academy Street, IV1 1LP. Hostel reception is open 8am - 8pm October to February and is open 7am - 10pm March to September. Cancellations made within 48 hours will be charged at the full rate for the first nights accommodation for each member of your booking using the card details provided at the time of the booking. Failure to check in on the booked date of arrival will incur charge to your credit card of the full amount of the first nights accommodation for all non-arriving guests and the remainder of the booking will be cancelled. Larger groups maybe required to pay a security and damages deposit of £50 per person, which is fully refundable where no security or damage issues have occurred. All members of the group must present valid ID upon arrival and pay the £50 deposit by card before collecting key cards and gaining access to the rooms. Failure to comply with these terms will result in losing your booking. Dogs are welcome in our private rooms or within our dormitories when the entire room is booked. We cannot allow dogs within shared dormitories. Parking on Church Street is limited, it is free after 6pm to 8am the next day. We recommend parking in Rose Street Multi Story Car Park! All rates quoted are inclusive of VAT and are subject to availability and alteration. Any deposits, paid either directly to Black Isle Bar or through one of our affiliate web sites are non-refundable All nights of accommodation must be paid for on arrival in full as stated in your booking confirmation and is non-refundable. If you wish to change or cancel your booking we require that you do 48 hours prior to arrival, failure to do so will result in a cancellation charge.If you booked via booking.com or hostelworld, you must cancel the booking direct with the agent. Children (under 18 years) must be under supervision of their carer. Children can be booked into our dormitories when the entire room is booked. Unfortunately we do not have wheelchair access to our rooms. Personal information will not be shared with any third party. Guests are required to provide details of their credit card as a guarantee of their reservation. These details cannot be provided via email,bookings must be made online or via phone call. All statements or representations made by any Black Isle employee will be of no effect unless it is stated in writing. Black Isle will not beheld responsible or any loss, damages or theft to client's properties within our establishment. All disputes, if not immediately resolved by the hotel management, will be handled by the Black Isle Brewery Office -info@blackislebrewery.com. We reserve the right to cancel or modify reservations where it appears that a customer has engaged in fraudulent or inappropriate activity or under other circumstances where it appears that the reservations contain or resulted from mistake or error. We reserve the right to reject your booking upon arrival if you appear to be intoxicated,aggressive or inappropriate to our staff. We reserve the right to charge your card for any damage or theft caused in the room. Charges will be deducted from the card details you have provided with your booking. 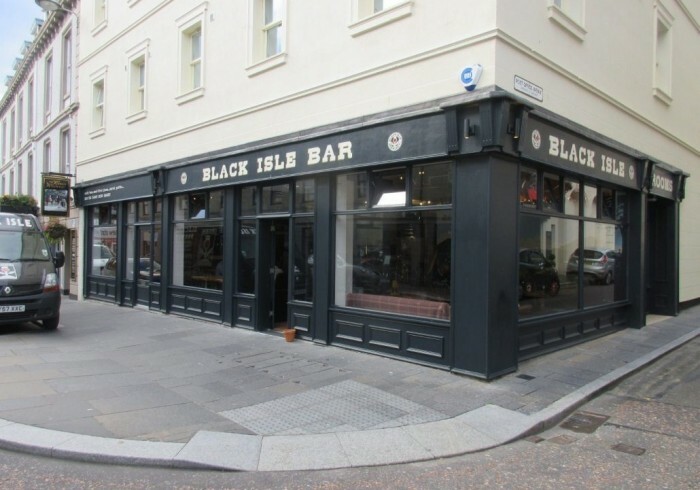 Black Isle Bar and Rooms has been open since July 2016. We have 14 en-suite bunk rooms each with an en-suite bathroom. Our bunk beds were custom made by a local company using quality wood for a comfortable nights sleep. At Black Isle Bar, we’ve carefully constructed our beer menu so that you’ll always find new styles and breweries.In keeping with the passion and creativity of the industry, we offer a wide range of great beers on tap, in cans and bottle too. As well as beer, we also have a fine selection of wines, whiskies and spirits.Our own beer comes from just across the water, from our organic farm on The Black Isle. If you’d like to experience it for yourself, we run daily brewery tours and free tastings too.Our signature wood-fired pizzas are renowned and made fresh to order using homegrown ingredients from our brewery farm. Where possible, we’ll use fresh, organic, seasonal salad and vegetables too. We’ve also got it covered for vegan, vegetarian and gluten-free diets.It’s not just pizza on the menu; if you’d rather a salad, soup or a meat & cheese board, there’s a great selection to choose from too.Ingredients we can’t grow ourselves come from local suppliers, which supports our Highland community. Please be aware that some of our rooms overlook the bar's 'Secret Garden' - A rooftop terrace with it's own bar and extra seating which is open till 1am daily. Some noise is to be expected.